This simple pendulum calculator is a tool that will let you calculate the period and frequency of any pendulum in no time. Read to to learn the period of a pendulum equation and use it to solve all of the pendulum swing problems. First of all, a simple pendulum is defined to be a point mass (taking up no space) that is suspended from a weightless string. Such a pendulum moves in a harmonic motion - the oscillations repeat regularly, and kinetic energy is transformed into potential energy, and vice versa. T is the period of oscillations - time that it takes for the pendulum to complete one full back-and-forth movement. L is the length of the pendulum (of the string from which the mass is suspended). g is the acceleration of gravity. On Earth, this value is equal to 9.80665 m/s^2 - this is the default value in the simple pendulum calculator. Determine the length of the pendulum. For example, it can be equal to 2 m.
Decide what is the acceleration of gravity. We will use the Earthly value of 9.80665 m/s^2, but feel free to check how the pendulum would behave on other planets. Calculate the period of oscillations according to the formula above: T = 2π * √(L/g) = 2π * √(2/9.80665) = 2.837 s.
Find the frequency as the reciprocal of the period: f = 1/T = 0.352 Hz. 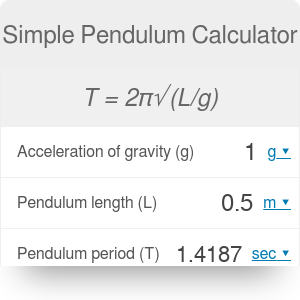 You can also let this simple pendulum calculator perform all calculations for you! Simple Pendulum Calculator can be embedded on your website to enrich the content you wrote and make it easier for your visitors to understand your message.